Start off your visit on the 15th (Fri): browse the exhibits of Rector's Palace and then take a stroll through Old Town. Here are some ideas for day two: delve into the distant past at Walls of Dubrovnik, view the masterpieces at Art by Stjepko, then examine the collection at War Photo Limited, then stop by Life According to Kawa, and finally get engrossed in the history at Franciscan Monastery. Start your trip to Dubrovnik by creating a personalized itinerary on Inspirock. Reykjavik, Iceland to Dubrovnik is an approximately 10.5-hour flight. You can also do a combination of flight and ferry; or do a combination of car and ferry. Due to the time zone difference, you'll lose 1 hour traveling from Reykjavik to Dubrovnik. Traveling from Reykjavik in February, expect Dubrovnik to be a bit warmer, temps between 15°C and 7°C. Finish up your sightseeing early on the 16th (Sat) so you can catch the ferry to Korcula Town. Start off your visit on the 17th (Sun): view the masterpieces at Bags by Kristina, learn about winemaking at Lovric Winery, then kick back and relax at Vela Przina Beach, and finally learn about winemaking at Korta Katarina Winery. 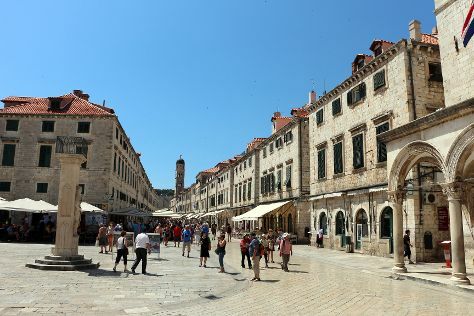 Get ready for a full day of sightseeing on the 18th (Mon): enjoy the sand and surf at Pupnatska Luca Beach, take in the architecture and atmosphere at St. Mark's Cathedral, shop like a local with Vapor gallery, then stop by Coral Shop Irena, and finally take an in-depth tour of Korcula Town Museum. To find ratings, more things to do, and more tourist information, you can read our Korcula Town trip app . You can ride a ferry from Dubrovnik to Korcula Town in 2 hours. Alternatively, you can do a combination of car and ferry. In February, daytime highs in Korcula Town are 17°C, while nighttime lows are 9°C. Cap off your sightseeing on the 18th (Mon) early enough to travel to Hvar. Start off your visit on the 19th (Tue): take a stroll through Milna, then do a tasting at Tomic Winery, then stop by Thesaurus Jewellery, and finally steep yourself in history at Spanjola. On the next day, get some thrills on the water with a speed boat tour. To see traveler tips, reviews, photos, and more tourist information, use the Hvar online route planner . You can do a combination of ferry and taxi from Korcula Town to Hvar in 2 hours. Alternatively, you can ride a ferry. Expect a daytime high around 17°C in February, and nighttime lows around 9°C. Wrap up your sightseeing on the 20th (Wed) early enough to ride a ferry to Bol. Start off your visit on the 21st (Thu): do a tasting at Stina, do a tasting at Wine Tasting Brac & Olive Oil Brac, then do a tasting at Senjkovic Winery, and finally take in the exciting artwork at Ivan Rendic Gallery. Here are some ideas for day two: enjoy the sand and surf at Lovrecina Bay, then examine the collection at Museum uja, and then examine the collection at The Island of Brac Museum - Skrip. Make your Bol itinerary with Inspirock to find out what to see and where to go. Bol is just a stone's throw from Hvar. In February, plan for daily highs up to 17°C, and evening lows to 9°C. 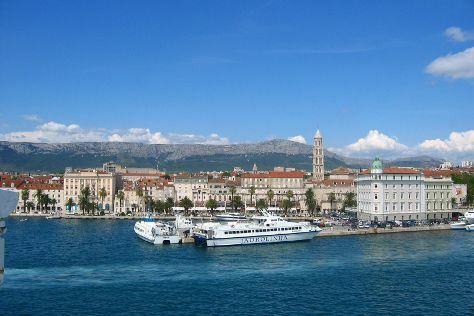 Cap off your sightseeing on the 22nd (Fri) early enough to catch the ferry to Split. On the 23rd (Sat), take in the architecture and atmosphere at Cathedral and Bell Tower of St. Domnius, then shop like a local with Jaman Art, and then take a stroll through Riva Harbor. To see maps, other places to visit, and tourist information, refer to the Split online trip planner . You can ride a ferry from Bol to Split in an hour. Other options are to do a combination of taxi and ferry; or do a combination of bus and ferry. Expect a daytime high around 15°C in February, and nighttime lows around 6°C. Wrap up your sightseeing by early afternoon on the 23rd (Sat) to allow time for travel back home.